The plan put together by the unnamed education task force a sub committee of cuee pushed Levy into having it at VSU, when VSU has clearly stated they are taking NO side!! So CUEE's educational plan was presented before the vote has been taken to an invited group at a public institution that is staying out of the whole stinking affair. This is all to strange to not ask why and who is behind this mess? Only Lemony Snicket could do justice to the peculiarity of last night's most educational meeting at VSU's Continuing Education building, about K-12 education even though neither school superintendent was there, most of the school board members were not present, and it was presided over by two very uneasy college presidents. Who called it was unclear, who was invited even less, for what purpose there was no consensus, yet there was a decision by the pair of presiding college presidents. 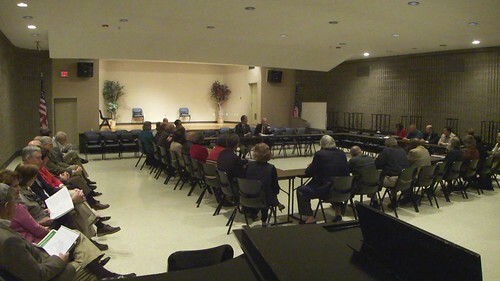 It was somehow about the general state of education in Valdosta and Lowndes County, Georgia, although the topic of consolidation was discussed only by the frequent admonitions that it was not to be discussed, and for that matter that nothing else related to educational improvements should be discussed until after the November 8th consolidation referendum. Both school system superintendents were elsewhere at a conference of school superintendents. A few Valdosta City School Board members were in attendance, although none of them said anything. I didn't recognize any Lowndes County School Board members. There were no introductions to the group, other than self-introductions by the two college presidents. Maybe you can identify some of the attendees. CUEE Vice-Chair Rusty Griffin near left, Chamber President Myrna Ballard far right, VBOE Member Jeana Beeland and CUEE Board Member Tom Kurrie near corner of the tables, SCLC President Rev. Floyd Rose to Kurrie's right. FVCS President Sam Allen is near the far end of the left side of the table. CUEE Board Member Walter Hobgood is near the far end of the right side of the table. So why did the list of community supporters disappear from CUEE's website? After a most educational meeting this evening so peculiar only Lemony Snicket could really write it up properly (more on that later), I found the answer to that question. First I asked Lee Henderson, who was on that list. He admitted he knew, but he wouldn't say. He suggested I talk to CUEE. Tom Kurrie walked up at that point, and I asked Henderson if Kurrie was CUEE. Henderson said I would know that better than he would, which caused me to refer to Black Crow's Mr. Henderson as very modest and humble. Tom Kurrie remarked that he always saw me with a camera, and at a previous event I'd asked him what was in unification for him. He reminded me he'd answered there was nothing in it for him, and I observed that was a good answer. Anyway, I asked CUEE Board Member Mr. Thompson Kurrie, Jr. what went with the list of supporters. He allowed as how he didn't really visit the web site very often, since he wasn't good with computers. So I asked who would know? He said that fellow over there at the table with the sign-in sheet, Daniel Storey.